60 days money-back & 24-month warranty. Any questions you have, please don't hesitate to contact us. We will get you back within 24 hours. Epoxy Resin Art is making our spare life more creative, It's such a versatile option that more and more people are joining in this group to create all different kinds of resin projects. -Art comes from life and goes beyond it and can also guide it. -E4ulife is the professional DIY supplier devoting to making your craft projects safer easier and more interesting. Features: 1: All the items are designed with the concept of simple and easy to use 2: Bulk purchase to save your time and save cost. 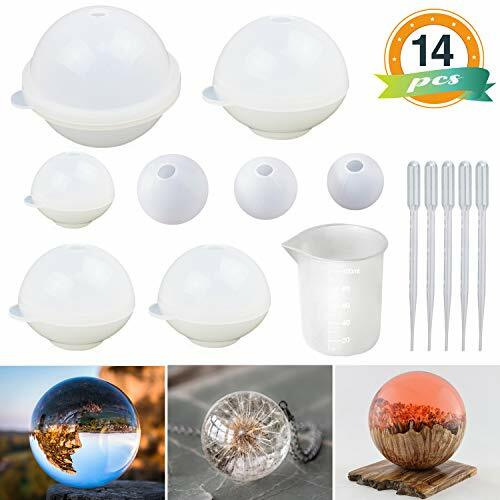 Package includes: 5* Silicone sphere molds diameter: 2.76", 2.36", 1.97", 1.57", 1.18" 3* Silicone star ball molds diameter: 1.18" 0.98" 0.79" 5* Plastic pipettes droppers 3ml with Length 6.1" 1* Nonstick silicone mixing cups for resin L* H: 2" x 2.8" Warm Tips for Resin Crafts DIY How to clean: Please clean the resin casting molds with clean water or rubbing alcohol when necessary, and then use a soft cloth to wipe clean. 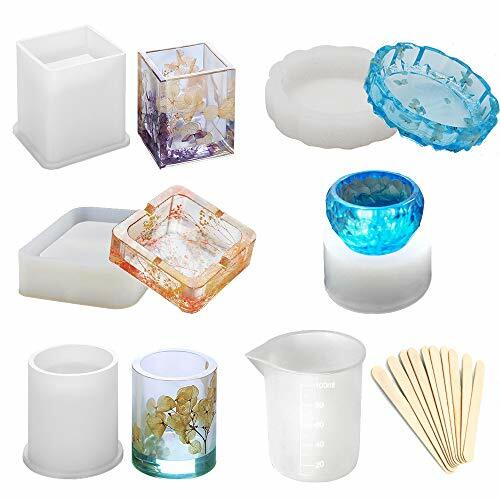 How to store: Please store the resin jewelry molds away from direct sunlight and dust. How to demold: You can use a mold release spray and let it dry in the mold. If you don't have, you may use a baby wipe or a drop of soap mix with a bit of water as a release agent, work it down to the mold, then push the project from the bottom. Note: Please make sure your resin piece is fully cured when you decide to demold. If you are a beginner, please read the attached instruction manual before starting. PREMIUM QUALITY SILICONE MATERIAL: The round silicone molds are made of food grade silicone with BPA free by advanced techniques, flexible durable reusable, durable high transparency, easy to use and clean. EASY TO RELEASE: These silicone resin molds in round shape are with smooth and shiny interiors, it can be easily popped out of the silicone molds once the finished works are fully cured. 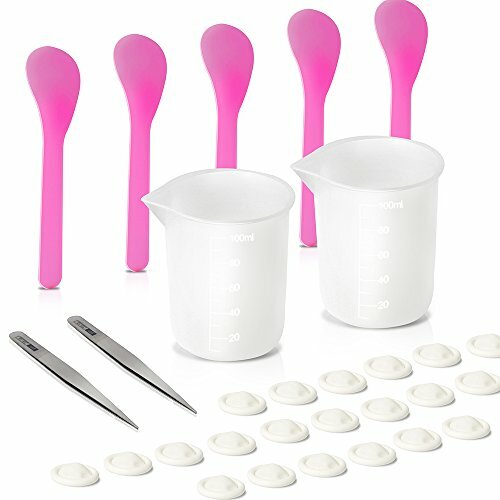 NONSTICK SILICONE CUPS PLASTIC PIPETTES: The 100ml measuring cup is feature of durable flexible and nonstick, it is an ideal mixing cups for resin and other small volume liquid or glue stirring, Its spout design makes it easier when pouring the liquid, 5pcs plastic pipettes are for easier, safer and precise liquid transferring. ENJOY RESIN DIY CREATIVE TIME: Share more time with families, make unique notebooks and bookmarks and other resin jewelry projects with lovers friends or kids. RESIN MOLDS WITH 100% QUALITY GUARANTEE: Provide 60-day Products Exchange and Money Back Guarantee if you are not satisfied with our product. Epoxy Resin Art is making our spare life more creative, It's such a versatile option that more and more people are joining in this group to create all different kinds of resin projects. -Art comes from life and goes beyond it and can also guide it. -E4ulife is the professional DIY supplier devoting to making your craft projects safer easier and more interesting. Features: 1: All the items are designed with the concept of simple and easy to use 2: Bulk purchase to save your time and save cost. Package includes: 3* Silicone rectangle molds with Sizes L* W*H: 4.3"*2.7"*0.9" 4.3"*1.9"*0.9" 4.3"*1.1"*0.9" 3* Silicone rectangle molds with Sizes L* W*H: 3.5"*2.7"*0.9" 3.5"*1.9"*0.9" 3.5"*1.1"*0.9" 2* Silicone square molds with Sizes L* W*H: 4.3"*4.3"*0.9" 3.5"*3.5"*0.9" 1* Silicone ball mold with Size : diameter: 2.3"*2.3" Warm Tips for Resin Crafts DIY How to clean: Please clean the resin casting molds with clean water or rubbing alcohol when necessary, and then use a soft cloth to wipe clean. 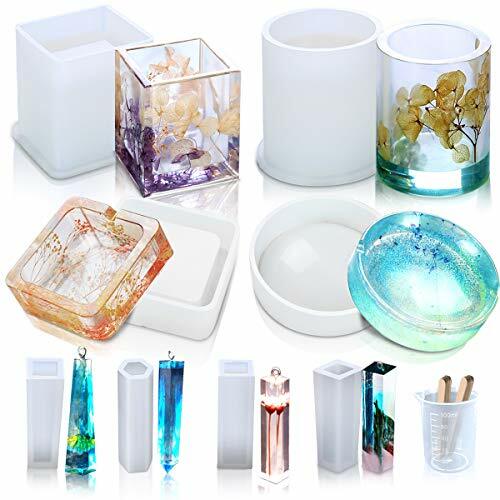 How to store: Please store the resin jewelry molds away from direct sunlight and dust. How to demold: You can use a mold release spray and let it dry in the mold. If you don't have, you may use a baby wipe or a drop of soap mix with a bit of water as a release agent, work it down to the mold, then push the project from the bottom. Note: Please make sure your resin piece is fully cured when you decide to demold. If you are a beginner, please read the attached instruction manual before starting. PREMIUM QUALITY SILICONE MATERIAL: The silicone square rectangle ball molds are made of silicone by advanced techniques, flexible durable reusable, durable high transparency, easy to use and clean. EASY TO RELEASE: These casting resin molds are with smooth and shiny interiors, it can be easily popped out of the silicone molds once the finished works are fully cured. 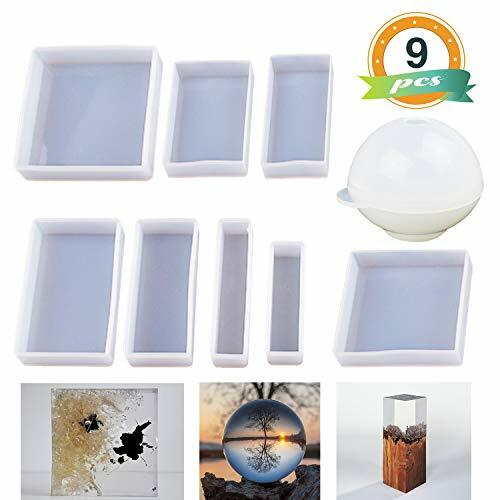 PACKAGE INCLUDES: Silicone resin molds rectangular 6pcs 6 sizes, silicone resin casting square molds 2pcs and ball resin mold 1pc. Great for making specimen, coasters, paperweights, soap dishes, wall decoration, bowl mat, home decoration, etc. ENJOY DIY CREATIVE TIME: Share more time with families, make unique notebooks and bookmarks and other resin jewelry projects with lovers friends or kids. How to clean: Please clean the resin casting molds with rubbing alcohol, and use a soft cloth to wipe clean. 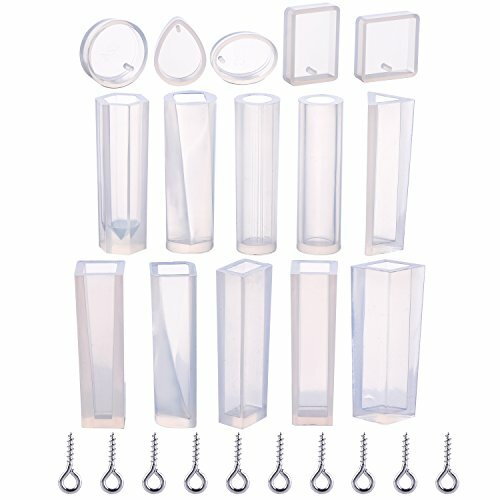 How to store: Please store the resin silicone molds away from direct sunlight and dust. then push the project from the bottom. Note: Please make sure your resin piece is fully cured. These beautiful transparent large resin molds make your casting more easier and fun! You can see everything inside the mold to minimizes wasted resin from errors in your work. Please refer to photos for details and do not hesitate to contact us if you have any questions before purchase. 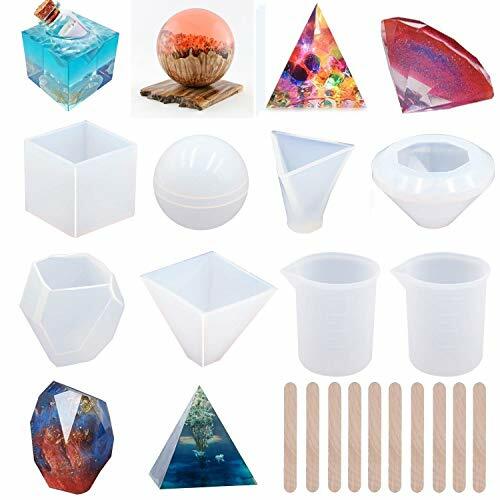 LARGE RESIN MOLDS: This big resin mold kit includes different shapes silicone molds, like Cube, Pyramid, Sphere, Diamond, Triangular Pyramid and Stone paperweight mold, also comes with 2pcs measuring cups,10pcs wood sticks, 1 roll Copper wire. You could create different art projects and have a lot of fun. HIGH-QUALITY SILICONE MATERIAL: These resin casting molds are made of durable silicone material, very flexible and easy to clean, make it reusable, with the transparent appearance, you can check the bottom when process project. 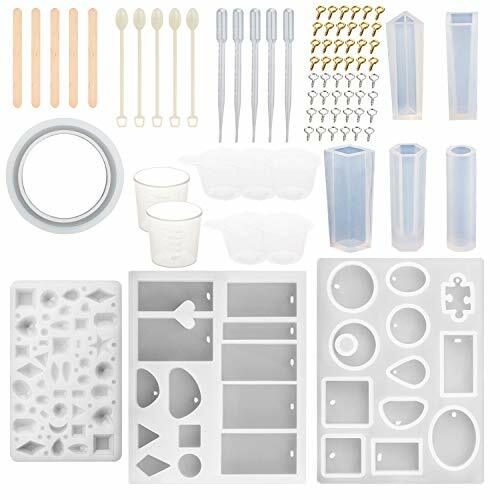 EASY TO DE-MOLD: These silicone resin molds are with smooth and shiny interiors, reducing the need to cut back and polish finished resin items. After your project is fully cured it will be easy pop out, or you could use resin mold spray, which may help you extend your silicone mold's life. SUITABLE FOR VARIOUS CASTING MATERIAL: These casting molds are compatible with most resins or other casting materials such as epoxy resin, polyester resins, soap, wax, candle etc. You can add some resin pigment, resin dye and embed different kinds of embellishments or fillers, perfect for making cabochons, orgone, resin jewelry, hanging ornaments, home decorations, paperweights, pendulum, art projects etc. EASY STORAGE AND CARE: Please store the resin molds in room temperature place, avoid from the direct sunlight. Clean these silicone molds with soapy water. REUSABLE GRADUATED CLEAR CUPS: 20pcs 2oz (60ml) Graduated plastic reusable cups, Imprinted in both fluid ounces and milliliters to provide clear and easy read. Extra 2pcs 100ml capacity measuring beaker for kitchen or laboratory use. 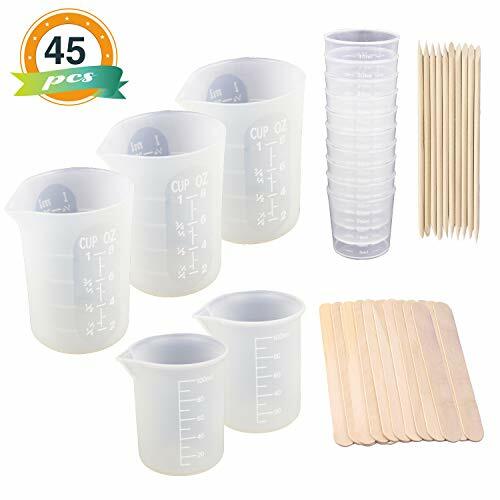 DISPOSABLE DURABLE PLASTIC CUPS & WOOD STIR STICKS: 50pcs Plastic cups with handle and a narrow flow mouth, easy to grip and precise to transfer the liquid; 50pcs 5.4in wood resin stir stick with chamfered ends, durable enough for mixing small batches from 1 ounce to 4 ounces. PLASTIC TRANSFER PIPETTES: 10pcs capacity 3ml,length 6.2 inches clear plastic dropper, the pipettes are ideal tools to quickly and easily move makeup essential oils, sprays and stains, inks from original containers to Mixture. NITRILE GLOVES & FINGER COTS: 2 XL and 3L pairs of Powder-Free and Latex Free Gloves are ultra soft and super stretchy providing maximum comfort for lab-related services, parts handling, janitorial services, painting, crafting and finishing services. 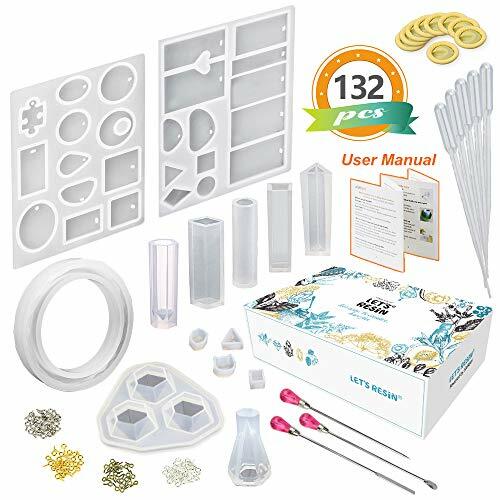 COMPLETE DIY MIXING CUPS SET WITH 100% QUALITY GUARANTEE : Total 137pcs, one-stop shopping to save your time hunting so many tools when making DIY crafts and other home or lab use; Provide 60-day Products Exchange and Money Back Guarantee if you are not satisfied with our product. When the glue dried, easy tear off it. Don't need to wash the cup. A perfect choice for DIY handmade lovers or those who are just new to resin jewelry making. It's easy to use and a good way to store your memory. Use your imagination, try to do some unique and special resin jewelry like the bracelet, earrings, pendant etc. It will be a special and meaningful gift for your family, children, friends as well. You will get much fun and satisfaction of designing the appearance you want, being able to wear something that you made is really a cool thing. How to clean: Please clean the resin casting molds with rubbing alcohol, and use the soft cloth to wipe clean. How to store: Please store the resin jewelry molds away from direct sunlight and dust. How to release: You can use a resin mold release spray. If you don't have, you may use a baby wipe or a drop of soap mix with a bit of water as a release agent before pouring the resin in the jewelry casting molds. HIGH QUALITY: These jewelry casting molds are made of durable silicone material, very flexible and easy to clean, make it reusable, with the transparent appearance, you can check the bottom when process project. 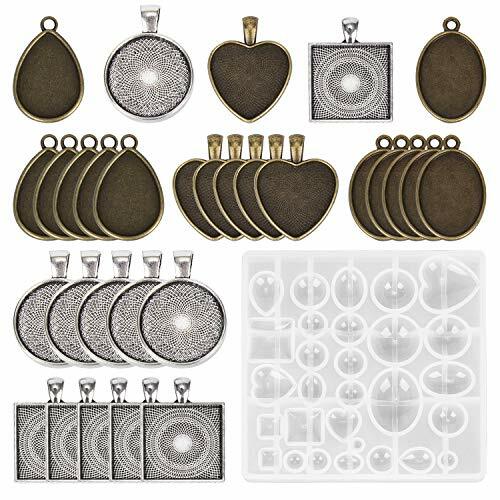 EASY TO DE-MOLD: These resin jewelry molds are with smooth and shiny interiors, reducing the need to cut back and polish finished resin items. After your project is fully cured it will be easy pop out of your resin mold, or you could use resin mold spray, which may help you extend your silicone mold's life. PRACTICAL TOOLS: The metal stirrers are made of stainless steel with diamond shape head, able to scoop, stir and mix the resin, or scoop out the resin decorations like glitter powder and the paillette. You can also use it as the nail art tools. Product Description: High-quality silicone, safety, high Flexible, full transparency, Super easy to de-mold The mold is used to create square coaster, beverage coaster, bowl mat etc, Mold is reusable There are not super soft, the bottom of the middle is not easy to bend The size of the three shapes of coasters is shown in Figure 5. 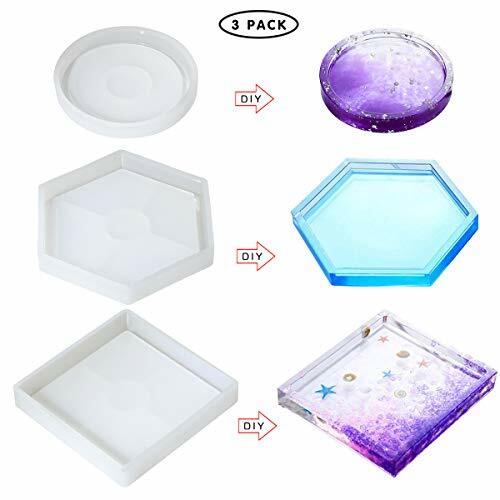 Need 3.4 oz of resin to fill Square mold, Need 3 oz of resin to fill Hexagon mold, Need 1.7 oz of resin to fill Round mold Please do not use Strong Corrosive Material, which will shorten the life of the coaster, and even lead to the failure to demould and damage the mold. Please do not use Strong Corrosive Material, which will shorten the life of the coaster, and even lead to the failure to demould and damage the mold. When you release the item out of the mold, just twist the mold, the piece can be easily push out, after using, easy to wash and clean with soap and water, and please put them away from dust after washing. 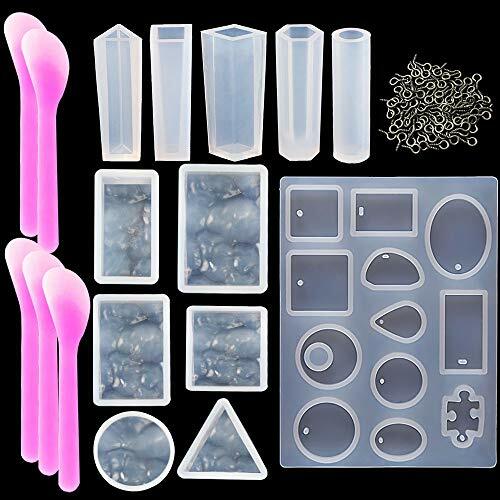 These moulds and eye screws are suitable for craft projects making and jewellery DIY, make pendants, earrings or other jewelry items, you can also add some flowers, glitter, colors to make your own crafts. Including small items, please keep them away from children under 3 years old. The kit can be applied to DIY different handicrafts and jewelry, such as key chains, earrings, necklaces, pendants, bracelets, etc., so that you can make special gifts for friends or family to show your love. In case of oxidization, please do not store them in damp, hot places. Please allow 2 to 3 cm errors due to the manual measurement. How to Learn: If you're a new learner, we suggest that you could search on line for videos or pictures on how to make resin crafts. How to clean: When finished with your silicone mold, wash it with warm water and mild soap before storing. Do not use solvents to clean your mold and do not place it in the dishwasher. Make sure your molds are completely dry before storing. How to store: Store your silicone molds in cool, dry area, out of direct sunlight and dust. How to demold: You can use a mold release spray. If you don't have, you may use a baby wipe or a drop of soap mix with a bit of water as a release agent, work it down to the mold. Then push the project from the bottom. Note: Please make sure your resin piece is fully cured. How to clean: You can wash it with warm water and soap or rubbing alcohol, then use a soft cloth to wipe clean. Do not use solvents to clean your mold. How to de-mold: You can use a mold release spray, a baby wipe or a drop of soap mix with a bit of water as a release agent, work it down to the mold, then push the project from the bottom. Please make sure your resin piece is fully cured. How to make: Pour resin into measurement cup, slowly stir to release bubbles. Adding glitter or pigment into it if you need. Then pour it into your mold and slowly stir. Allow to stand for 24 hours and take it out. Art resin molds are made up of silicone, safe and durable, and not easily damaged. With transparent appearance, you can check progress at any time. Creating by your own imagination and favor, that's really cool and full of special meanings. You're a designer when making resin casting molds. Warning: For the small pieces, please keep away from babies, kids, children. 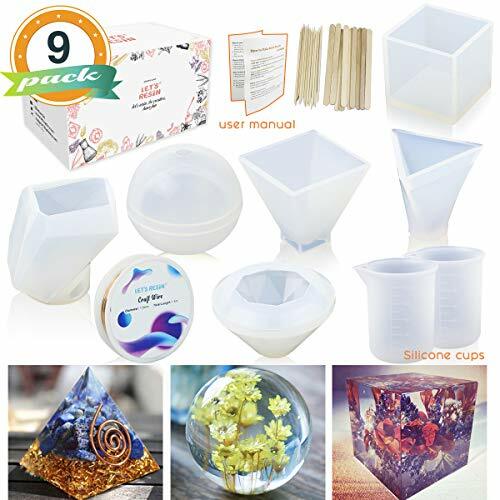 Value Pack: Package includes 1x Large round ashtray mold, 1x large square ashtray mold, 1x large cube mold, 1x large cylinder mold, 4x small pendant molds, extra equipped with one measurement cup and 10 wood sticks. 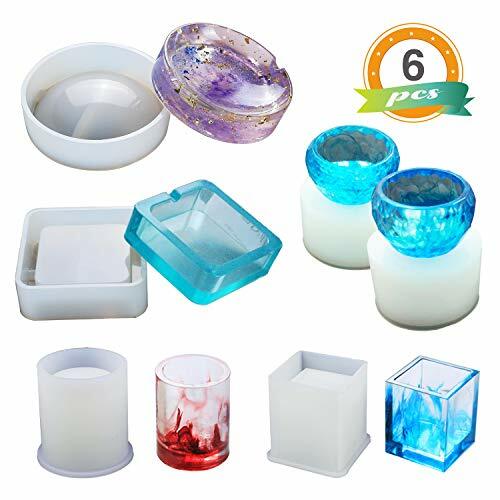 Application: Perfect for making decorative resin crafts such as ashtray, pen holder, soap holder, wax candle holder, flower plants port, compatible with most resins or other casting materials. Easy to De-mold: Smooth interior makes it easy to de-mold after it's fully cured and reduces the need to cut back and polish. Or you can use release spray or soap water which may help extend silicone mold's life. Durable and Not Easily Deformed: Our molds are made up of pure silicone with excellent elasticity, superior high tear strength, etc. After squeezing and deforming, just rest for a while and then will return to the original state. Great Gift: Great molds for making decorative ornaments. You also can add dry flower, pearl pigment, mica powder, glow in the dark powder, glitter and sequins into the resin mold to get a colorful mold. PACKAGE CONTENT: 1 Pcs x Large Round Molds, 1 Pcs Large Square Molds, 1 Pcs Cube Resin Molds, 1 Pcs Cylinder Resin Molds, 2 Pcs Small Bowl Molds. WIDE APPLICATION: These large resin molds are compatible with most resins or other casting materials such as epoxy resin, polyester resins, etc. Perfect for DIY Coaster, Flower Pot, Ashtray, Pen Holder, Candle Holder, Soap Holder, storage bow, etc. HIGH QUALITY: This resin silicon mold is made with quality durable silicon by advanced techniques. The finished product is precise, high transparency, flexible and easy take off from the mold. EASY TO RELEASE: You just need to twist the silicone mold and release your creation out of your coaster molds when completely cured. Or you could use resin mold spray, which may help extend your resin casting molds' life. Warm Remind: If you don't know how to make resin castings, we suggest that you could search guide videos online and learn. Material: Silicone resin molds,flexible and durable,smooth. Easy to use and clean. Various designs: The Jewelry Mold Making has many different shapes, such as square, rectangular, round, etc. They can meet your needs. Plastic stirrers to help you stir the glue and plastic droppers to help you extract liquid. High quality : Improved version, high quality silicone. Share your handiwork with your friends and family, enjoy happy times. Quantity: 1 piece . Material: silicone . These molds, you can make comb&mirror, or make necklaces, key ring and so on. Descriptions: 1. Tasteless, non-toxic, dust resistant, durable, no permeate and easy to clean. 2. Suitable for making cake, chocolate,Decorations, pendants,etc. Please Note: Due to hand measure, the size may have 1-2 cm error. Due to Different Monitor, the color may have difference. Aouke Molds: Makes your life full of surprises and fun. Features: high quality silicone.flexible, durable and reusable, easy to get the mold out. Keep clean wash with soapy water and keep stored in a dry dust free area.stay away from strong acids. 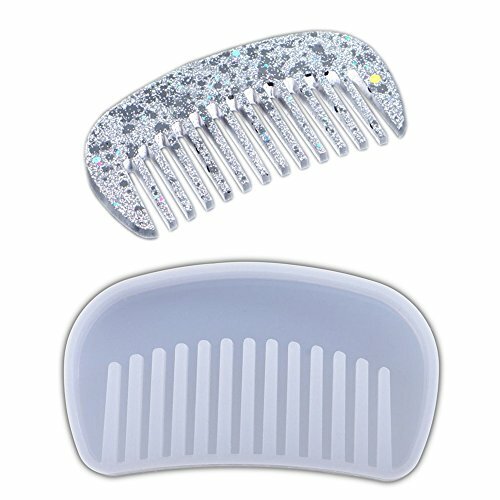 Comb Shape Silicone Molds: this mold is used to make combs, you can make for your self a comb of their own. TIPS: This mold, because it is handmade so a little flaw, but does not affect your creation. if you are a perfectionist please consider carefully. It is suitable for craft projects making and jewelry DIY, make pendants, earrings or other jewelry items, you can also add some flowers, glitter, colors to make your own crafts.You will get beautiful and special jewelry gift. 1.For the small pieces, please keep away from babies, kids, children. 2.When you release the item out of the mold, please make sure your resin piece is fully cured. PACKAGE CONTENT: This resin molds including 3pcs silicone crystal mold(Size 1: 67*60*42mm, Size 2: 61*54*48mm, Size 3: 70*54*41mm), 6 different style Jewelry Pendant Molds and 5pcs droppers. WIDE APPLICATION: You can put some dried flowers or any other materials to make any handicrafts, such as jewelry, earrings, necklaces, scented candles, paperweight and so on. HIGH QUALITY: Made of durable silicone material, very flexible and easy to clean,make it re-usable, with the transparent appearance, you can check the bottom when process project. EASY TO USE: With smooth and shiny interiors, after your project is fully cured it will be easy pop out of your mold, or you could use release spray, which may help you extend your molds life. STORAGE AND CARE: Make sure the resin molds is smooth and clean inside before making and should be cleaned after use. Recommended store the resin jewelry molds away from direct sunlight and dust. If you have any question, please feel free to contact us at anytime. We're here to help. 98 pieces of jewelry casting mold set to meet all your needs. Improved version, high quality silicone. Share your handiwork with your friends and family, enjoy happy times. 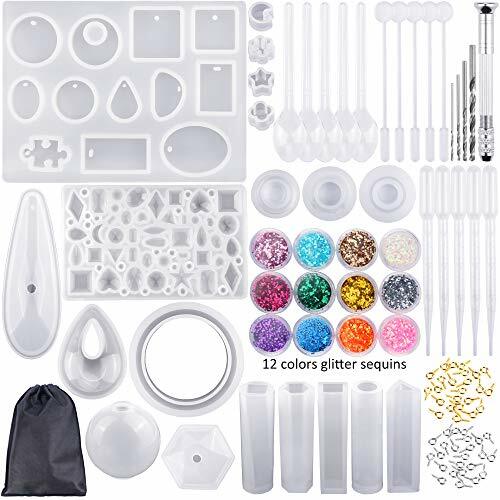 PACKAGE INCLUDES - 19 x jewelry making molds, 25 x gold screw eye pins, 25 x silver screw eye pins, 5 x plastic stirrers, 5 x plastic spoons, 5 x plastic droppers, 1 x Hand Twist Drill (include 4 pieces twist bits), 12 x glitter sequins, 1 x Storage Bag. MATERIAL - Silicone resin molds,flexible and durable,smooth. Easy to use and clean. Screw eye pins are made of metal alloy, stirrers, droppers and spoons are made of quality plastic, hand twist drill is made of stainless steel. SIZE - Pendant molds are 1.95 inches high with diameters from 0.35 inch to 0.4 inch, 2 sets casting molds have 66 designs with 4.4 inches to 6 inches long and 2.7 inches to 4.9 inches wide; Inner diameter of bracelet mold is 2.4 inches. Inner diameter of the three rings mold is 0.72 inches.The maximum length and width of three holed solid crystal pendant moulds are 3.3 inches and 1.88 inches respectively. WIDE APPICATION - Can be applied to diy different handiwork and jewelry, such as key chain, earrings, necklaces, pendant, bracelets and more, with many operating tools, help you make them more easily. PRACTICAL TOOLS - Metal twist drill make you bore a hole easily. 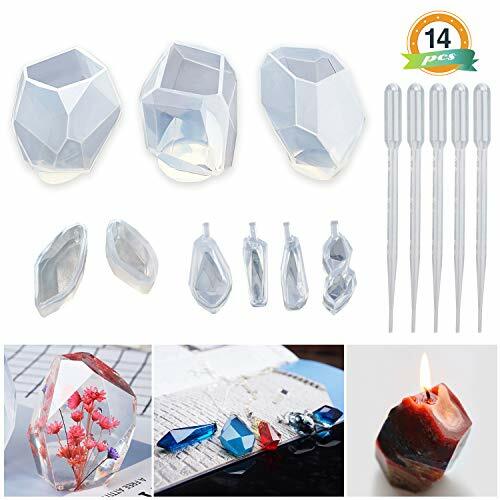 Plastic stirrers to help you stir the glue and plastic droppers to help you extract liquid; VARIOUS DESIGNS - The Jewelry Mold Making has many different shapes, such as square, rectangular, round, Long column, polygon, etc. 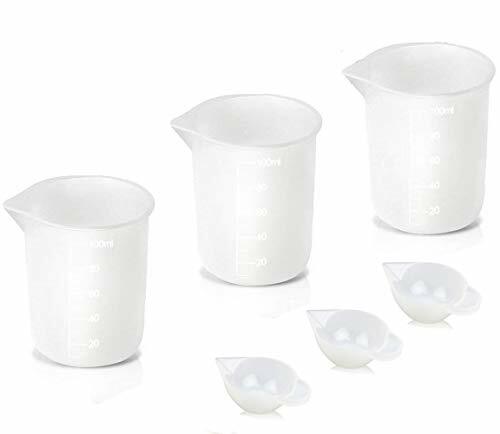 Silicone Measuring Cups for Resin: BPA free, 2pcs 100ml graduated reusable silicone measuring cups, smooth durable nonstick lining, flexible body and flexible spout measuring beaker silicone cups for resin kitchen art craft use. Mini Nonstick Silicone Cups: 4pcs silicone mixing cups for resin, Epoxy, Liquid, Paint, and Stain, toning color, liquid epoxy resin glue distribution, etc. Reusable, non toxic and non pyrogenic. Size: 45x25mm. Silicone Mat: Made of reusable silicone sheet, durable and flexible, size: 15.7*11.8in, thickness: 1 mm. This silicone mat is non-stick surface, so it will keep your worktop clean and super easy to clean. Silicone Stir Stick: 2pcs reusable silicone sticks, length 5.3in. Keep you from constantly purchasing sticks, just wipe clean using baby wipes and you able to use the silicone sticks over & over. When you mix the resin, it create less bubbles compared to wood. 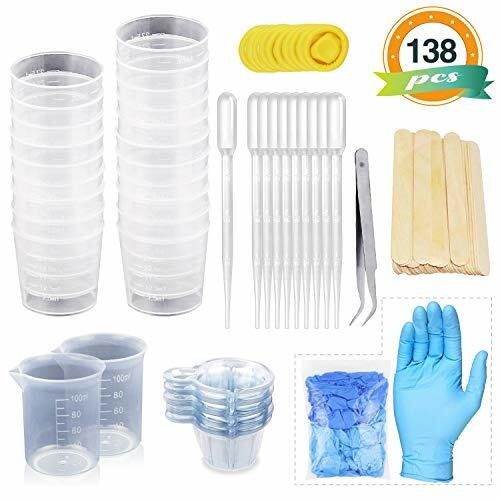 Finger Cots and Plastic Transfer Pipettes: 20pcs free sized finger cots to keep liquids mixture from skin. 10pcs capacity 3ml, length 6.1 clear plastic dropper, the pipettes are ideal tools to quickly and easily move resin from original containers to Mixture. Why is it necessary for handicraft art hobbyists to prepare a complete set of nonstick silicone measuring cups set in our daily life? 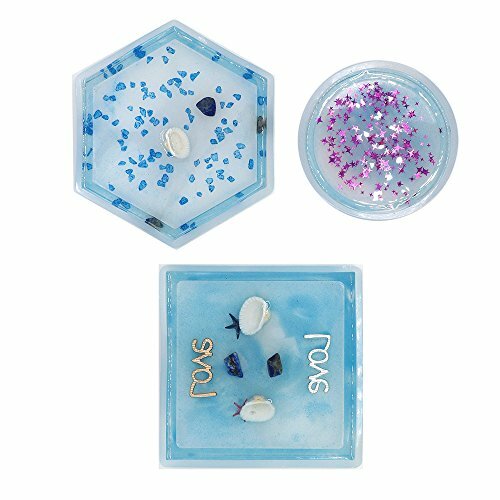 The DIY silicone molds are perfect for making decorative resin crafts such as coaster, beverage coaster, bowl mat etc. 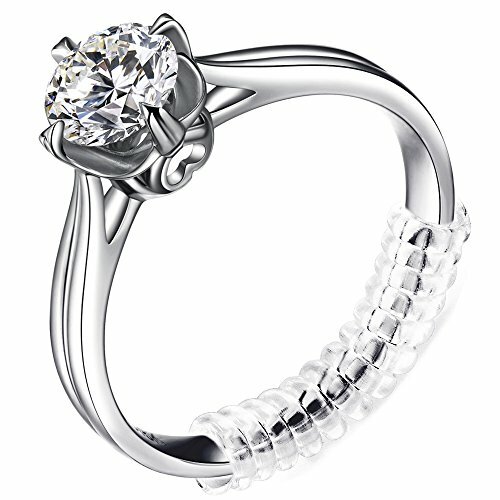 Hexagon, round and square gives you more advanced beauty, and your creation is unique in the world. We just provide silicone molds.Please DIY ! Your creation is unique in the world. Durable and Not Easily Deformed - Our molds are made up of pure silicone with excellent elasticity, superior high tear strength, etc. After squeezing and deforming, just rest for a while and then will return to the original state. Easy to De-mold - Smooth interior makes it easy to de-mold after it's fully cured and reduces the need to cut back and polish. Or you can use release spray or soap water which may help extend silicone mold's life. 250ml Silicone Mixing Cups: BPA free, 3pcs 250ml(8oz) reusable silicone cups for resin. There are two types of scales, Ounces, and Milliliters on each cup, Flexible construction allows you to pour liquid precisely with no spills. 30ml Plastic Graduated Cups: The transparent scale cup has accurate laboratory markings in 1 oz(30ml) and 5 ml increments for ease of use. Made of solid polycarbonate plastic, It is strong and non - fragile, and has easy-to-read external measurements. 20pcs 5.4 epoxy mixing sticks and 10pcs 6 tip sticks for puncturing the resin bubbles and can help to move the location of the fillers, all sticks made of green wood, fresh clean and durable enough. 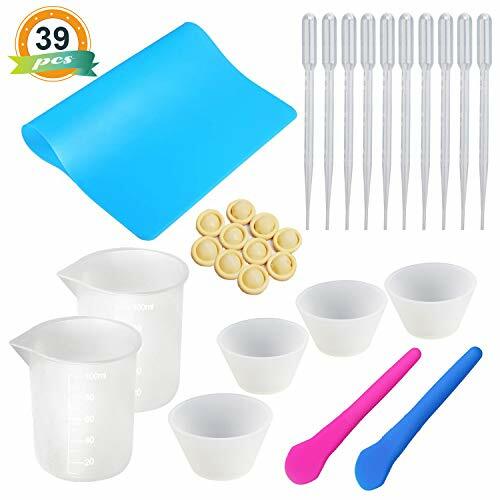 COMPLETE DIY MIXING CUPS SET WITH 100% QUALITY GUARANTEE: Total 45pcs, one-stop shopping to save your time hunting so many tools when making DIY crafts and other home or lab use; Provide 60-day Products Exchange and Money Back Guarantee if you are not satisfied with our product. ATTENTION: It is best to pour resin in layers for this large size mold. If large amounts of resin are mixed in one time, it may result in overheating and warp your mold. The chemicals heat up faster when larger amounts of resin are mixed at once and may burn or warp your pouring cup or mold. 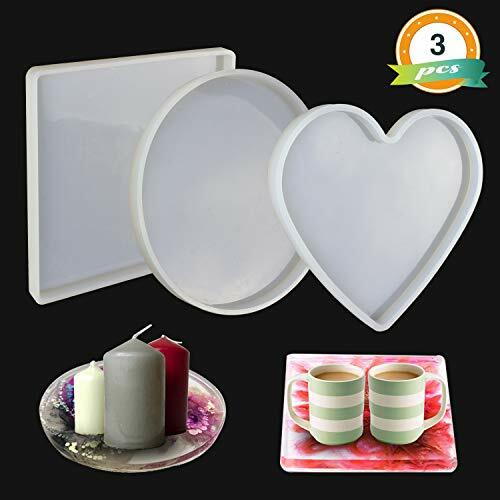 EXTRA LARGE SIZE SILICONE MOLDS: This resin mold kit includes 1 x square mold, 1 x round mold, 1 x heart mold, perfect for making resin coasters, place mat, candle holder, tray for fruits, spoon rest for kitchen etc. DURABLE SILICONE MATERIAL: These resin molds are made of high-quality silicone material, very flexible and durable, the finished product is very shiny and transparency. EASY TO RELEASE&CARE: You just need to twist the silicone mold and release the pieces out of the molds when the resin is completely cured. Or you could use mold spray, it helps extend the mold's life. After you used, wash them with soap water, let them dry out and keep them in flat, store in a cool place, avoid the heat and sharp tools. ATTENTION: It is best to pour resin in layers for this large coaster mold. If large amounts of resin are mixed in one time, it may result in overheating and warp your mold. The chemicals heat up faster when larger amounts of resin are mixed at once and may burn or warp your pouring cup or mold. 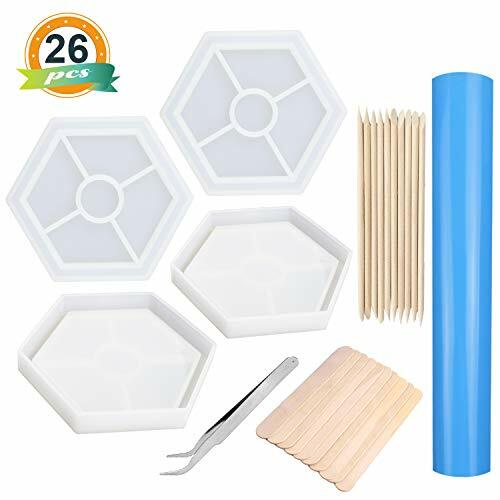 PACKAGE INCLUDE: This resin molds kit includes 4 x hexagon resin molds, 1x A3 silicone mat, 10 x wood mixing sticks, 10x wood toothpicks, 1 x tweezer. HEXAGON SILICONE MOLDS: Unlike the normal coaster molds, the groove of the molds makes the finished products with a fence bar, avoid the annoying experience caused due to water overflowing. A3 SILICONE MAT: The dimension is 15.7x11.8inch, big enough to hold the 4 pcs hexagon molds at the same time, preventing the resin spills and protect your work area, a reusable and environmentally item you must have during casting resin. EASY TO DE-MOLD: You just need to twist the silicone mold and release your creation out of your coaster molds when the resin is completely cured. SUITABLE FOR DIFFERENT KINDS OF CASTING MATERIALS: These molds are compatible with diverse casting materials such as resin, concrete, plaster, polymer clay, very suitable for making coasters, candle holder, flower pot holder, cellphone holder, bowl mat etc. 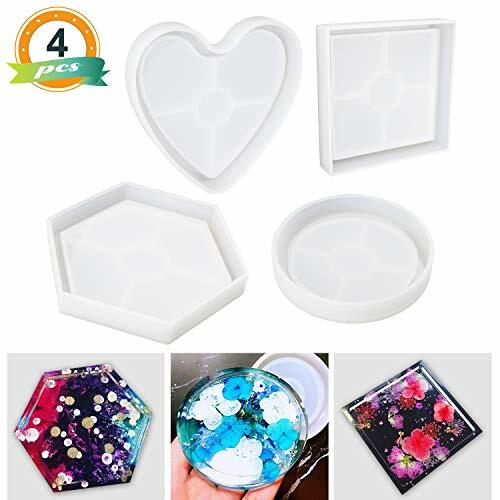 VARIOUS SHAPE COASTER MOLDS: This resin molds kit includes 1 x round resin mold, 1x square resin mold, 1 x hexagon resin mold, 1 x heart resin mold, the most popular shape and size for coasters. Unlike the normal coaster molds, the groove of the molds makes the finished products with a fence bar, avoid the annoying experience caused due to water overflowing. DURABLE SILICONE MATERIAL: These resin molds are made of high-quality silicone material, very flexible and durable; the finished product is very shiny and transparency. SUITABLE FOR DIFFERENT KINDS OF CASTING MATERIALS: These molds are compatible with diverse casting materials such as resin, concrete, plaster, polymer clay, etc, very suitable for making coasters, jewelry holder,candle holder, flower pot holder, cellphone holder, bowl mat etc. EASY TO DE-MOLD: You just need to twist the silicone mold and release your creation out of your coaster molds when the resin is completely cured. Or you could use resin mold spray, it helps extend your resin molds' life. STORAGE AND CARE: After you used, wash them with soap water, let them dry out and keep them in flat, store in a cool place, avoid the heat and sharp tool. Since the Asian size is smaller than the US size, please order 1-2 size. Check the size details above for reference. Thank you! All products are shipped from abrard requires 15-22 days. If you want fast delivery, please choose express. We have our own suppliers, so our products are of good quality and low price. Otherwise, we often have promotions. Please do not hesitate to place an order. If you have any questions about the product, please contact us immediately via email. We will provide you with a satisfactory solution. search results Size:S US:4 UK:6 EU:34 Bust:86cm/33.9" Length:77cm/30.3"
Size:M US:6 UK:8 EU:36 Bust:90cm/35.5" Length:78cm/30.7"
Size:L US:8 UK:10 EU:38 Bust:94cm/37.0" Length:79cm/31.1"
Size:XL US:10 UK:12 EU:40 Bust:98cm/38.6" Length:80cm/31.5"
Size:XXL US:12 UK:14 EU:42 Bust:102cm/40.2" Length:81cm/31.9"
Size:XXXL US:14 UK:16 EU:44 Bust:106cm/41.7" Length:82cm/32.3"
Size:XXXXL US:16 UK:18 EU:46 Bust:110cm/43.3" Length:83cm/32.7"
Size:XXXXXL US:18 UK:20 EU:48 Bust:115cm/45.3" Length:84cm/33.1"
occasion Elegant and elegant women, suitable for dating, daily leisure, formal parties, business, dance, bridesmaids, wedding parties, parties, birthday parties, formal parties, families, cocktails, etc. Material : Polyester - it is made of high-quality materials and is durable enough for everyday wear. This beautiful design dress will steal your heart! Chic and comfortable, you can't go wrong with this amazing cute top! match perfectly matches your favorite shoes, jewellery, bags, beautiful hairstyles and stylish Christmas prints to make you more attractive and perfect party, shirt or petticoat is very beautiful, I believe you will like it! Dimensions Please refer to the size details in the picture before purchase, and allow 1-2 cm difference due to manual measurement. Depending on the computer image resolution and display settings, the colors may vary slightly depending on the website. Logistics You get: 1 *Female---our logistics time is generally 15-25 days. If you have any questions, we will handle it for you. For example, we can help you return, change the size for free, and more. Production Description: Material: Silicone. 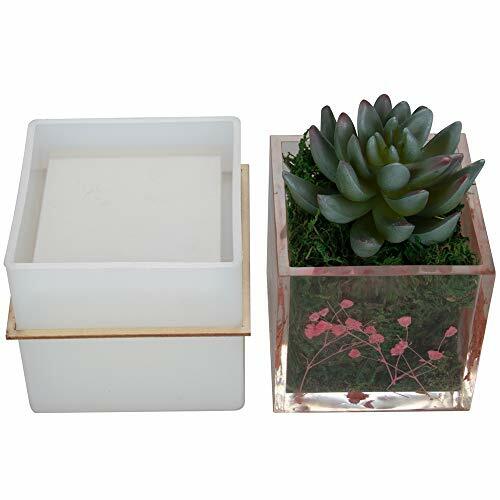 Silicone Is Flexible, Resistant To Tearing, Durable In Use, Easy To Use And Clean This mold is used to make Brush pot, Flower pots, DIY Flower Pot Molds, planter pot mold or some other decorations. it's reusable You can also put small objects into the transparent resin, like a dry flower, sea shell, small stone, etc Can Be Used As Resin, Cabochon, Polymer Clay, Gum Paste, Pmc, Wax, Candle, Soap Mold And They'Re Reusable Dimensions: Internal Width 2.87", internal depth 2.95", Need 8.6 oz resin to fill it. So this is a giant mold. It needs to be layered when the temperature is above 86F. It is recommended to cool with water. Size: Internal Width 2.87, internal depth 2.95, Need 8.6 oz resin to fill it. So this is a giant mold. It needs to be layered when the temperature is above 86F. It is recommended to cool with water.